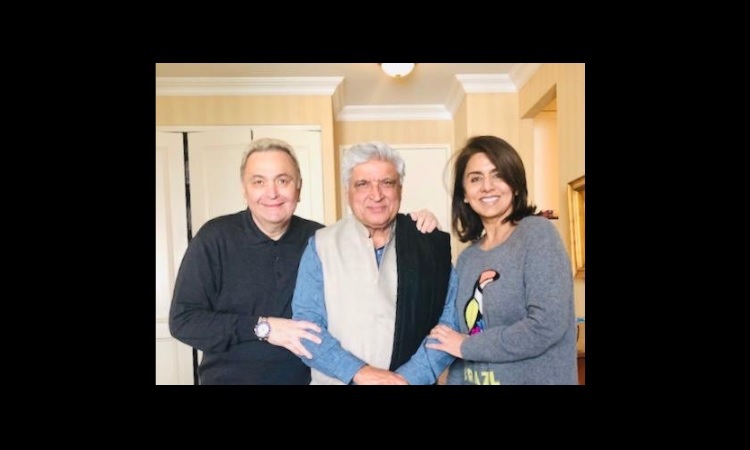 Javed Akhtar conveys his best regards to ailing actor Rishi Kapoor! Bollywood superstar Rishi Kapoor is currently receiving medical treatment at New York. Many close friends and B-Town celebrities are known to visit the ailing star. No sooner, the actress Priyanka Chopra and Alia Bhatt had visited him, recently Javed Akhtar visited the actor and conveyed his best regards. As the singer visited Rishi Kapoor and wife Neetu Singh Kapoor, he took to his social media handle and uploaded a picture. His caption read: "Thank you Javed Sahab for entertaining and making us laugh so much. Thank for visiting us! Wish you all super luck for your block buster musical shows. Believe me-your show is a break through idea." Along with spreading positive vibes, Javed Akhtar entertained the actor and also made the healing actor smile as he brought back the good spirits.